Nothing’s cozier on a cold winter night than a few wooly throw blankets on the living room sofa. IKEA is a great source for inexpensive fluffy blankets. Have them on hand for when the kids get tired and need a nap, or for your Aunt Bertha’s cold feet. Speaking of cold feet, one of my favorite hosting tips is to have a variety of warm slippers in a basket by the door. You can buy slippers for cheap at Walmart or Target. Since everyone is going to be taking off their snowy boots, having a cozy alternative in which to walk around the house is a thoughtful touch. Bring on the lamps — the warm glow they cast says “holiday” much better than glaring overhead lights. Dim them to an attractive yellow glow, allowing candles, fireplaces, and other sources of lighting to shine. Cut down on the time you’re serving your guests and make them feel more at home by having a variety of hot drinks available on the kitchen counter. Packets of hot chocolate and tea and a carafe of hot coffee are all that’s needed. For a special holiday treat, have a large pot of mulled wine simmering in the slow cooker, with cups nearby so guests can serve themselves. I don’t know what it is about front-door wreaths, but to me, they make a home so much more welcoming. The same goes for fall flowers or poinsettias set on the front stoop. Learn how to make your own autumnal wreath at Design*Sponge. In the winter, I love the smells of gingerbread and pumpkin pie. If you’re not a baker, scented candles in warm winter scents like cinnamon, cranberry, and pumpkin spice really set the tone for winter celebrations. Make sure guests have easy access to all the necessities — extra towels, bottles of water, soap, and shampoo. If you have many guests (a common occurrence over the winter holidays), put towels in a big basket by the bathroom door so guests can help themselves. Help children and the young-at-heart to feel right at home by setting out board games on a low table in the living room. Traditional games like Chinese checkers and backgammon are easy to play, and more modern games like Settlers of Catan, Cranium, and Ticket to Ride will draw board-game enthusiasts. Have soft music playing in the background to set a festive mood — whether that’s holiday classics or Coldplay’s latest album. Keep fresh rolls of toilet paper visible and within easy reach, so guests have no excuse to go rummaging through your bathroom cabinets. As I recently had occasion to learn, some guests (like pregnant women) are perpetually ravenous and need sustenance at all hours of the day and night. For hungry guests on the prowl late at night, keep a stash of cookies and snacks available on the kitchen counter for guests to help themselves. They don’t have to be homemade; use store-bought snacks for greater convenience. For those times when guests need some down time, keep an assortment of classic family friendly DVDs available that kids and adults will enjoy. Your guests don’t expect you to be their slave, so enlist their help to clear dishes, prepare food, and set the table. Getting everyone involved evokes togetherness and holiday spirit, and prevents you from going crazy. Delegate! You’re already providing a place to stay for your houseguests, so don’t feel that you need to be Martha Stewart when it comes to the menu. Breakfast can be store-bought croissants and orange juice, and lunch can be a self-serve buffet of deli meats and fruit. Suggest going out or ordering in (and splitting the bill) to save yourself money and time. If you’re hosting big family meals like Christmas or New Year’s, prepare the main course yourself and delegate side dishes to other family members. So your centerpiece is looking a bit lopsided? Relax! Your guests won’t notice little details and certainly won’t be judging you on not being the perfect host. Toilet overflowing and sending sewage-scented water down through the living room ceiling? Now that might merit a minor freak-out. 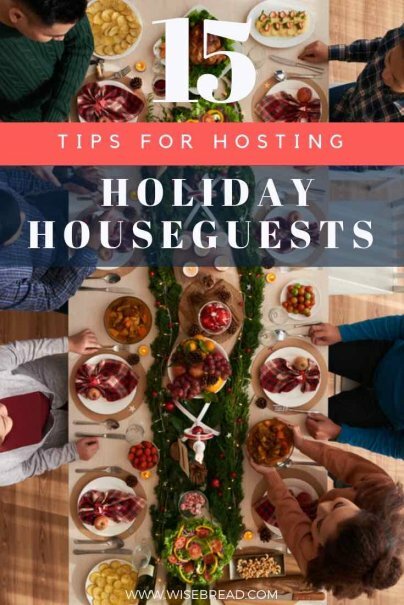 Do you have any useful tips and tricks for hosting houseguests this winter? Okay, Camilla, you've convinced me -- I'll come stay with you for the holidays. Haha! Meg, be my guest! Only we'll be doing a major home renovation this winter, so I probably won't be following my own advice! I really loved the suggestions in this article.. Even though we are not expecting any houseguests (knock on wood) I did every single suggestion just for us!! Our house is feeling really homey and warm right now..
You're welcome! You're right -- these are all things we should do for ourselves right now, not just for our guests!